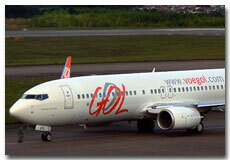 GOL Transportes A�reos is the second largest low cost airline of Brazil with its base in Sao Paulo, Brazil. GOL Transportes Aereos operates scheduled air flight services to about 38.6% of the domestic destinations in Brazil and 12.2% of international flights operations. It is famous with its slogan GOL Intelligent Airlines. Online booking of GOL Transportes Aereos flight tickets reservations is available here. You can also buy cheap flight tickets of GOL Transportes A�reos online now. The airline was founded in 2000 and started providing air flight services in 2001. Grupo �urea, a Brazilian company, wholly owns it. GOL signed code-share agreement with TAP Portugal to start operate flight services in Europe.